Zencube is the world's first smart Himalayan salt lamp. Not only can you change the colour of the lamp via your smartphone, you can bask in the beautiful glow of nature. It’s the best of the natural world in one stylish, modern package and all the benefits of a Himalayan salt lamp with none of the drawbacks. Better Health: Zencube brings all the rich benefits of the outdoors to your home. 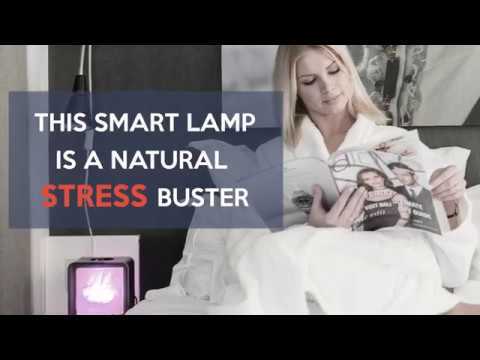 The lamp's natural salt is heated by an energy-efficient LED bulb to send negative ions into the air to balance the bombardment of positive ions that we are exposed to every day. Beatiful Design: Zencube is a stylish update to traditional Himalayan salt lamps, with beautiful, chic design and its compact size is perfect for any space, including office and apartment areas. Brilliant technology: Zencube is the world's first smart lamp, and the first Himalayan Salt Lamps that has combined traditional salt lamps functionality with modern, contemporary design and the latest RGB LED technology. You can change the colour to reflect your mood or environment via smartphone App. LED bulbs are also 90% more efficient than their traditional halogen rival. This means no leaks, no mess and no hassle. Feel good and save the environment one glow at a time. Brighter Mood:Not only do the negative ions emitted by the Zencube help to purify the air, helping us to breathe easier and sleep better, the pure cubed block is the perfect complement to any room. Turn your home into an oasis of purity.